a Lake Superior lodging paradise, we have it all for you. Our cozy cottage invites you to explore its many beautiful experiences while lodging on this majestic lake shore which is the cleanest and largest fresh water lake in the world. Scenic area attractions and outdoor activities in Munising and Au Train are only a short distance away. 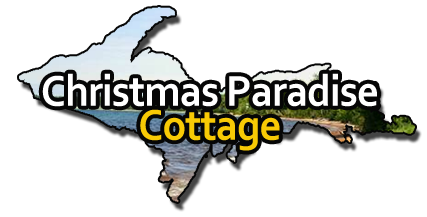 Please browse our site and make your plans to visit our Christmas Paradise. Thank you for visiting. After many months of searching we knew Christmas was the place for us. It has been an honor and privilege to share our place over the years. Many visitors from around the world have enjoyed the beautiful scenery and great people of the area. As a child, I spent most of my summer vacations on my grandparent’s dairy farm in Chatham (not far from Christmas). I also went to Northern Michigan University in Marquette. I have always loved being in the Upper Peninsula and dreamed of having a place on Lake Superior. Christmas is a wonderful place to be any time of the year and we hope you agree. Snowmobile Michigan : Discover the miles of groomed snowmobile trails connecting villages, towns and scenic resources during winter.